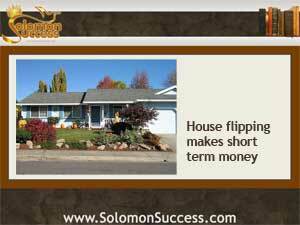 Solomon Success > Blog > House Flipping: Sound Investing? Flipping houses puts money in a seller’s pocket, but how does it stand up as a strategy for building long term wealth? King Solomon’s advice for wise money management tells us to make prudent decisions with an eye to long term success – and while quick buys and even faster sales make short term cash, as Jason Hartman points out, that strategy doesn’t lead to long term wealth. Though it’s always been around, house flipping surged in popularity after the housing crash of a few years ago, made much easier by the sheer numbers of distressed houses in the market. Foreclosed homes that could be bought for next to nothing, and houses put up for short sale by desperate owners became a flipper’s dream: buy the property cheap, make some quick fixes, and sell it again for far more than it cost. House flipping is still touted as a way to get rich by “investing” in real estate – but flipping really isn’t investing. Though a seller may make relatively fast money from quick turnaround on a refurbished house, a certain amount of that money will have to go toward the costs of buying another property. And in order to keep on making money, that cycle will have to be repeated again, and again. Sounds more like a business model, doesn’t it? What’s more, the IRS takes notice. Properties that are quickly flipped – bought and sold in under a year – are considered “short term” and subject to a higher capital gains tax than those that are held as long term assets for a year or more. And those fast sales – assuming that the market supports such a quick turnaround – mean that sellers don’t usually get the chance to take advantage of the long list of tax breaks available to those who hold on to their properties long- term. That strategy – buying and holding income properties – is real investing: letting the asset work for you over time with a steady income flow. House flippers are always on the lookout for the next sale – and their “investing income” is only as good as that sale. True investors, who hang onto properties with long term fixed rate mortgages, avoid the risks of an up and down housing market and reap the rewards of tax breaks and no capital gains taxes – or significantly lower ones if the property is eventually sold.